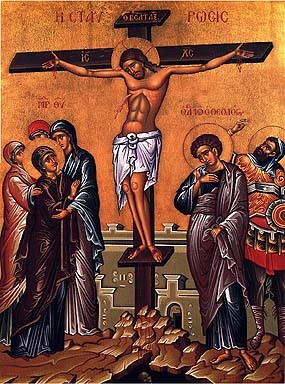 There are a couple of curious Gipsy legends regarding the Crucifixion of the Lord Jesus Christ. One of the legend claims that the gypsies which were present on the Lord’s crucifix, tried stealing the nails because of Love for the Lord to prevent crucifixion and for this deed of them some legends say the Mother of God the Holy Virgin Mary blessed them to steal from all nations, also the legend said this give the Gipsys permissions to steal without breaking one of the 10th commandments “Thou shalt not steal“. Of course this legends are mainly circulating in gipsis communities mainly in Europe and we should consider and as every legend its probably just a myth, however I decided to place the legend here on my blog because while living in the Netherlands for 2.5 years I have been helped and had the opportunity to live among Bulgarian gipsy community and I was fascinated on the strongness of gipsies family relations – which in this time of family break up and lack of respect is quite of a blessing. It was also evident for me gipsies know how to keep together and support each other, something becoming more and more rare in the “highly civilized” but less and less mental / spiritual western world which in its intellectual revolution forgot how to live simple and free life which was originally given to us by God Almighty. There are other variants of the legend also, some say it was a gipsy blacksmith which was ordered to prepare the nails for Jesus’s crucifix, other probably more modern Gipsy legends claim that a gipsy stole one of the 4 nails for the Crucifix and this is why the Lord was crucified with 3 nails (1 nail piercing both of his legs as Roman Catholic cross does) – however this legend is untrue because in the ancient Christian tradition it was 4 nails with which the Lord Jesus Christ was pierced on the cross. Another of the legends (probably not originating from Gipsys says), it was a gipsy blacksmith who made the nails to crucify Jesus Christ, beacuse of that the (Gipsys) were condemned to wander the earth and never settle. Another version does not condemn blacksmiths. It says that the blacksmith was addressed by God in a dream, where he was told to make four nails, but only hand over three, as the fourth was intended to pierce the heart of Jesus. In return God gave his descendants the right to wander the earth (rather than cursing them to it) and also the right to steal from non-Romanies, without breaking the commandment Thou shalt not steal. This entry was posted on Friday, September 12th, 2014 at 6:05 pm	and is filed under Christianity, Curious Facts, Everyday Life, Various. You can follow any responses to this entry through the RSS 2.0 feed. You can leave a response, or trackback from your own site. the white sun what to say or what to do in the confusion that was there. be asked and though we could do it ; no, not at all (said the narrator).